Earn 90 loyalty points when you order this item. Oyaide SPSL are state-of-the-art spade lug connectors that provide an excellent and elegant connection for your speaker cables - made from a specific metal mix following extensive listening. The base material is RoHS compliant pure brass and a combination of silver and platinum plating. The main body is trimmed from a phosphor bronze bar of 15mm in diameter by precision CNC machining and is finished by mechanical barreling and hand polishing piece by piece. The highly-rigid 5mm stainless screw is used for the 4mm cable penetration part. This infills inside space between the body and the screw. 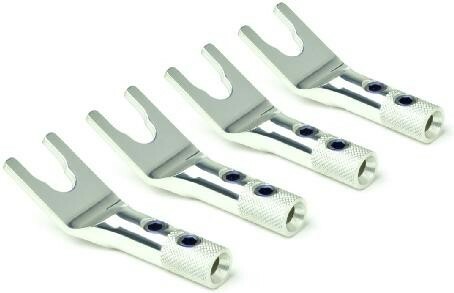 The blue screws, made of stainless with quench hardening treatment, are highly-rigid and emphasize the beauty of SPSL.